WINNIPEG - RCMP are now providing information about a horse spotted in a field on highway 256 South that was clearly in distress. During the evening of April 6th Melita RCMP were responding to a call when they passed the horse in the field. The responding officer took one look at the horse and knew something was wrong. The officer attended to a call and when finished she went back to where she had seen the horse. The horse was still there; it had not moved. Cst. Kristin Foreman approached the horse and saw it was in obvious distress, with no food, water, or shelter anywhere in sight. The horse was emaciated and extremely lethargic. Under the Animal Care Act, RCMP officers are considered Animal Protection Officers, so Cst. Foreman seized the horse, named Foxy Lady, and with the help of community members, ensured it was transported to receive emergency medical attention in Virden. "I couldn't leave Foxy there," said Cst. Foreman. "She was so small and so sick. There was nothing nearby that she needed for her survival. My duty is to assist anyone in distress, so that's what I did." After receiving veterinary care, Foxy was taken to a temporary boarding stable where she would have a warm stall, with lots of food and water, and veterinary care. "I could tell Foxy was in distress and starving," said Cst. Foreman. "Her bones were protruding and she was not doing well. 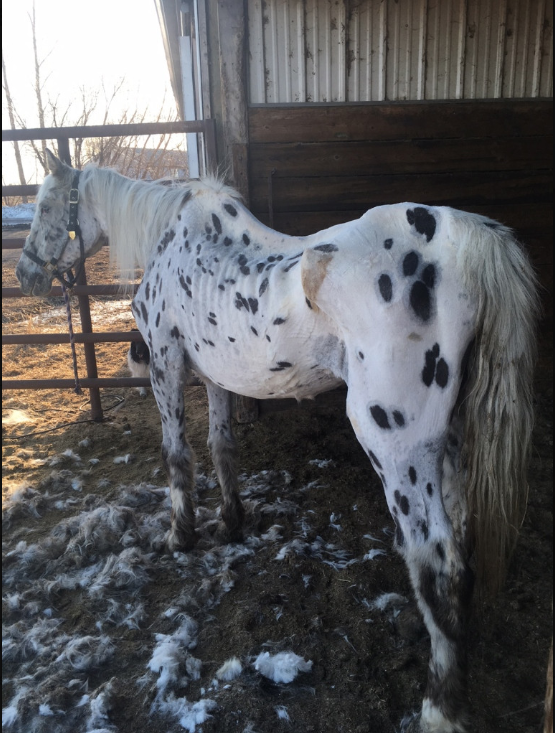 After seeing the vet, we learned that Foxy was a 35-year-old Apaloosa mare and, along with the rest of her health concerns, she had some issues with her eyesight." After calling the Chief Veterinarian's Office, a joint investigation was launched. It was determined the horse had been neglected in a pasture without access to the necessities of life. Foxy's owners were charged with Failing to Provide an Animal with an Adequate Source of Food and Water and Failing to Provide an Animal with Adequate Medical Attention when Wounded or Ill, both under the Animal Care Act. On April 25 the decision was made by veterinarians to humanely euthanize Foxy Lady to prevent undue suffering as her health concerns were severe. Further charges may be pending. If you know of animals in distress, you can call the Animal Care Line at 1-888-945-8001 or you can call the RCMP to make a report.